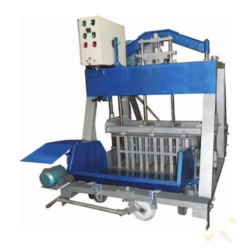 Pioneers in the industry, we offer hollow brick making machine, brick making machine, automatic brick making machine, semi automatic brick making machine, hydraulic brick making machine and brick production plant from India. Benny Enterprises are the Pioneers and Market leaders in the manufacturing of an unlimited range of Brick Machinery. These are manufactured using a State-of-the-Art infrastructure and by a dedicated team of experienced Professionals in the Industry. Ø Total Power - 40 H.P. Ø Hydraulic Motor - 12.5 H.P. Ø Hydraulic Oil Cooling Motor - 1 H.P. 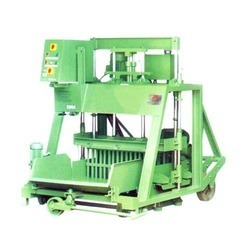 Ø Brick Out Conveyer Motor - 2 H.P. Ø Main Mix Conveyer Motor - 3 H.P. Ø Pan Mixing Motor - 20 H.P. 400x200x200 – 4nos. 400x200x150 – 5nos. 400x200x100 – 8nos. Cellular Lightweight concrete bricks are produced by adding millions of micro-sized air bubbles into a cement based mixture. The addition of millions of air bubbles is achieved by using a Proprietary foam generator to produce highly stable and injecting the foam directly into a concrete mixer containing a cement/ fly ash / water slurry. The hardened material consists of small-enclosed air bubbles thereby resulting in all light weight stable cellular material with densities ranging from as low 300kg/ m3 to 1800kg/ m3. The Hardened material consists of small enclosed air bubbles thereby resulting in a lightweight stable cellular material with densities ranging from as low 300kg/ M3 to 1800kg/ M3. Good curing gives strength and dimensional stability to bricks. 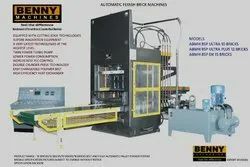 Bricks are cured either by air curing or high pressure steam curing procedure. Because of great-Engineered properties, cellular light weight bricks have become popular in wide range of applications in construction sector. Complete plant can be transported in one truck. Plant requires only electric power supply and water connection. Accurate fast and reliable electronic foam injection. Enhanced thermal and sound performance due to less joints. Economic design, savings in cement and steel. Easy handling even jumbo size due to lower density. Light-weight- 1/3 rd the density of clay bricks. Savings in recurring energy costs in air-conditioning. Deal material for wall construction in hotels, auditoriums, studios, hospitals etc. Can fulfill required STC (Sound Transmission Class ) rating. Suitable for low -soil bearing capacity & seismic zones. Facilitates construction of unplanned walls any where anytime. 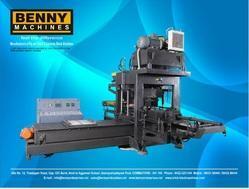 Looking for Brick Making Machine ?